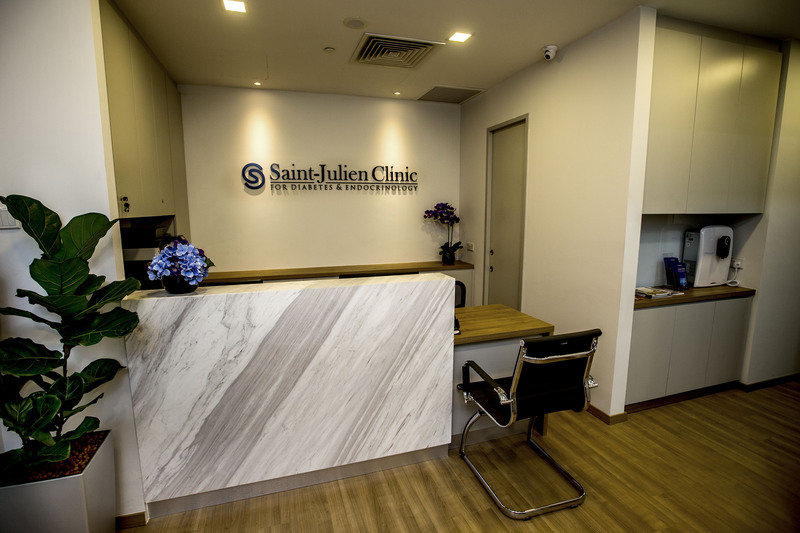 Saint-Julien Clinic is a specialist centre for diabetes and endocrinology founded on experience and expertise. Our mission is to deliver exemplary medical care by combining the time-honoured skill of sound clinical acumen with the latest in evidence-based medicine and medical advances. Our Diabetes and Endocrine Clinic is set up to help and treat patients with diabetes, thyroid and hormonal disorders. We understand that diabetes can often affect other organ systems and therefore provide screening for complications in accordance with national and international best practice guidelines. In addition, we also partner with other specialist doctors to provide our patients with a multi-disciplinary support for their diabetic, thyroid and endocrine conditions. As healthcare professionals in the 21st century, we recognize the importance of patient education in the successful management of any disease, particularly in the area of chronic diseases such as diabetes, thyroid, osteoporosis and cholesterol disorders. Hence, we aim to make patient education a key component of all our treatment plans. As healthcare providers who demand clinical excellence, we look forward to enriching the lives of our patients by always putting their best interests first. Saint-Julien is the birthplace of Claude Bernard, the French physiologist who first coined the term ‘milieu intérieur’ (internal milleu) to describe the concept of the internal environment. This led to significant research on how the body communicates using messengers such as hormones to maintain a balanced internal environment, a process we now call homeostasis. He also discovered the importance of the liver in diabetes development and as well as the role of the pancreas in digestion. But perhaps Bernard’s most important contribution to medicine was the introduction of scientific objectivity to experiments, described in his discourse, ‘An Introduction to the Study of Experimental Medicine’. His works paved the way for the rigorous methodology that has become standard practice in modern-day clinical trials and has transformed how medical care has evolved. This is especially true in the field of endocrinology where existing paradigms on diagnostic thresholds and treatment continue to be refined and challenged by new evidence from clinical trials. In adopting the name Saint-Julien, our hope is that the Clinic will always represent the place where our patients’ healing journeys begin. As the master gland, the pituitary is the starting point for the logo. The symmetry of the anterior and posterior lobes is mirrored in the two graceful circular forms employed. Also referenced is the blue circle, which is the universal symbol for diabetes with a further modification to subtly include the Saint-Julien Clinic’s initials–SJC. The final form creates the impression of balance which is a fundamental tenet of endocrinology. These references symbolize the aim of the Clinic to help its patients achieve equilibrium through the sound practice of endocrinology.